Who doesn’t love fudge?! In my opinion, it is the best candy in a Christmas goody tin. Especially Double Chocolate Fudge. Double Chocolate Fudge is two layers of yummy goodness! It is also really simple to make which is the best part of all! This recipe for Double Chocolate Fudge only uses a few ingredients and goes together very quickly. 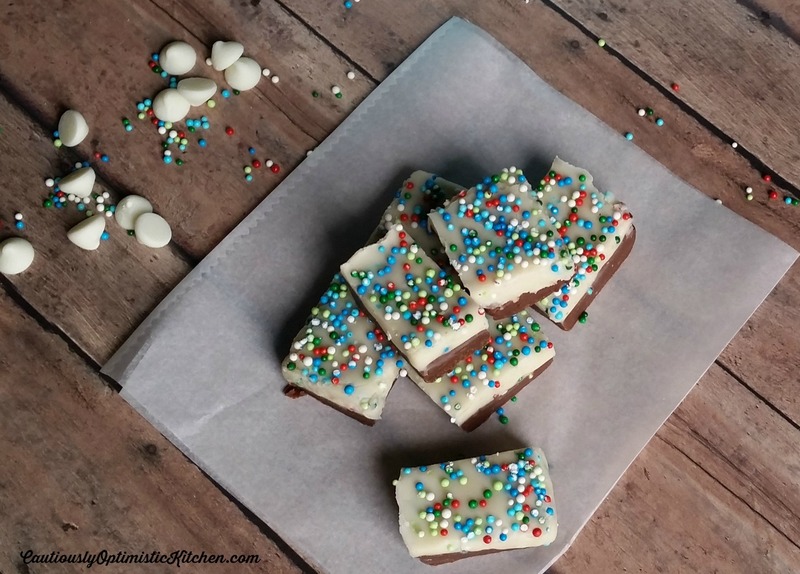 A combination of white chocolate and semi sweet chocolate is only made better by the addition of pretty nonpareils! 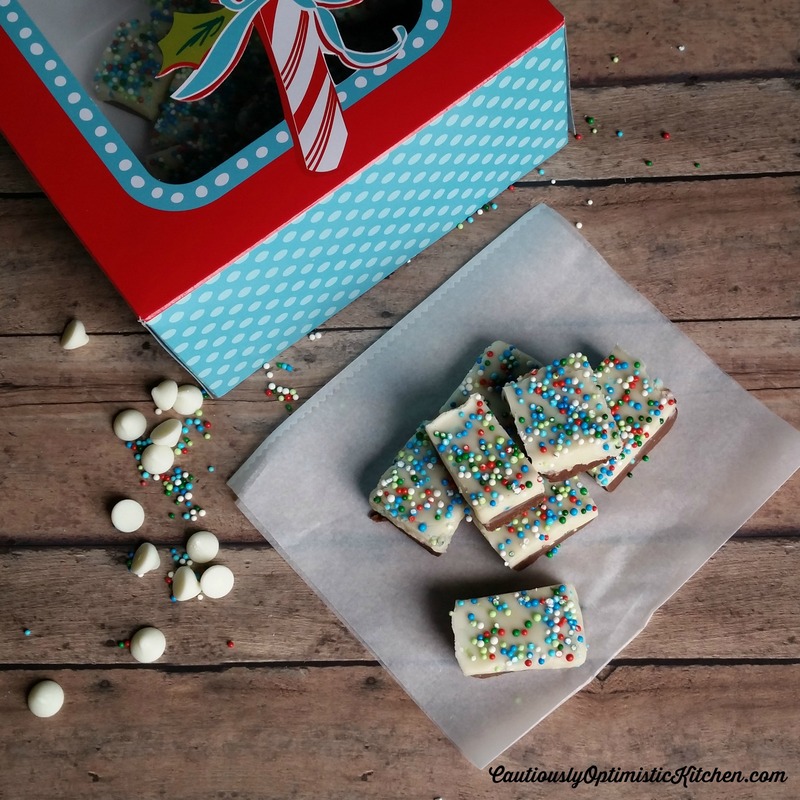 If you are looking for something really easy and eye catching for your Christmas candy tin, then this is the recipe for you! This fudge was the star of my candy gifts this year. All the colors really popped among the other goodies occupying the same space, including Caramel Peanut Clusters, Cracker Toffee, Snicker-doodles, and No Bake Cookies. 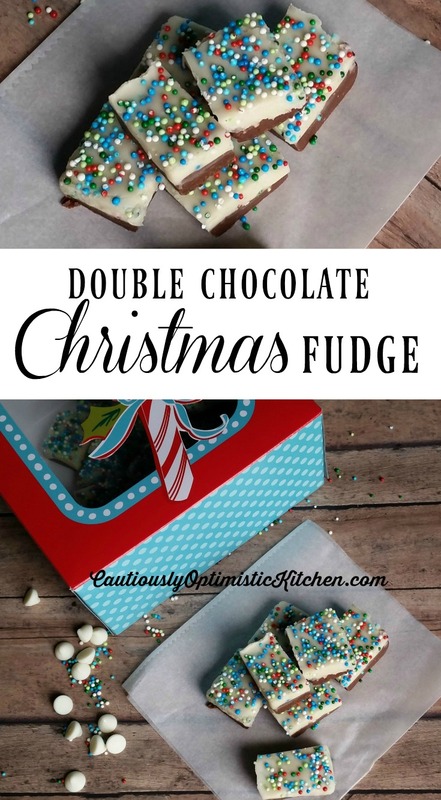 I know that you are anxious to get started making this recipe for Double Chocolate Fudge so let’s get to it! Dark Chocolate Fudge: Combine semi sweet chocolate chips, milk, and butter in a heavy bottom sauce pan. Cook over low heat siring constantly until chocolate is melted. Continue to stir until chocolate is a thick, smooth consistency. Pour and spread chocolate mixture into an 8"x8" square pan lined with foil. White Chocolate Fudge: Combine white chocolate chips, milk, and butter in a heavy bottom sauce pan. Cook over low heat siring constantly until chocolate is melted. Continue to stir until chocolate is a thick, smooth consistency. Stir in vanilla. Gently stir in a handful of nonpareils. Do not over stir or the nonpareils will begin to melt. Pour and spread chocolate mixture over the dark chocolate layer. Sprinkle top of fudge with more nonpareils. Let fudge cool to room temperature and then move to refrigerator to finish cooling. Cut directly from refrigerator to keep your edges clean. Store in a tightly covered container in the refrigerator or at room temperature. If you make this fudge be sure to let me know how it turned out! Oh, and don’t forget to Pin it for later!